Waikiki is as rich and diverse a neighborhood as you'll find on any of the Hawaiian islands. With its stunning beaches, its flowing palm trees, its breathtaking mountain views and its endless ocean, it's about as close to heaven as you'll ever find on Earth. At Captain Cook Resorts, we offer a variety of Vacation rentals in Waikik. Are you looking for a condo on the beach? Do you want to find yourself situated in the heart of the bustling city near all the restaurants and attractiosn? Do you desire a view that spans from the heavens to the vast picturesque beaches far below? Whatever you are looing for in a Waikiki vacation rental, we probably have it available at one or more of our condos. 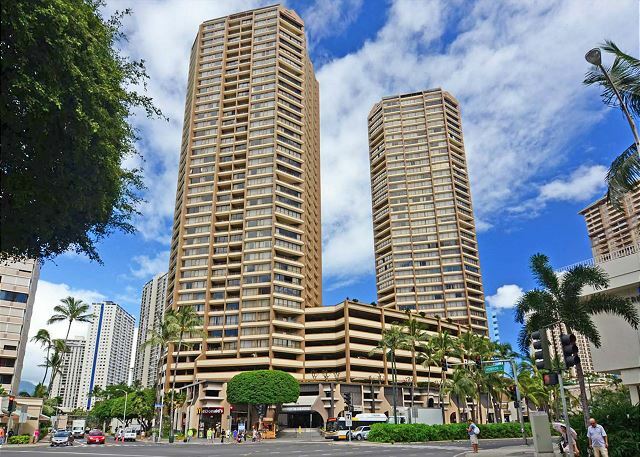 Aloha Towers is a quiet residential condominium in central Waikiki. This is where to stay in Waikiki if you want to be close to good restaurants and shopping in the newly restored Waikiki Beach Walk area. The beaches of Waikiki are just a short walk from the Aloha Towers rentals. All Aloha Towers condos have central air conditioning, a full kitchen, washer and dryer in condo, high speed internet connection, on site swimming pool, tennis courts and free parking. Linens, dishes, towels and beach towels are supplied. We currently have 2 bedroom, 2 baths condos which are perfect for families or 2 couples. Monthly rates are available for Corporate, Business Professionals, Registered Nurses, or those relocating to Honolulu. Canal House overlooks Ala Wai Canal and the Ala Wai municipal golf course, and offers sweeping views of the Koolau mountains. This building has 8 units per floor and secured parking starting on the 7th floor. 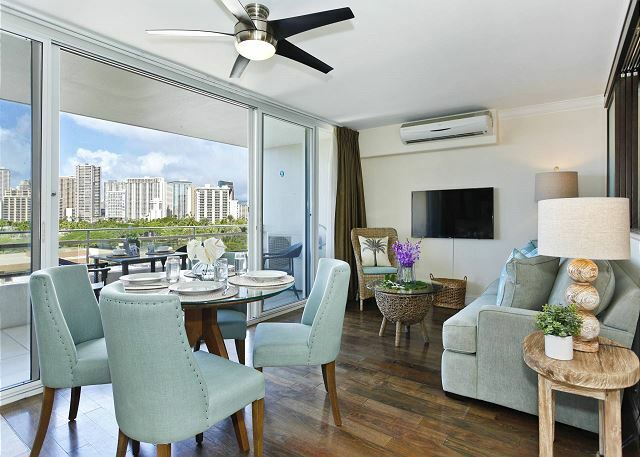 Captain Cook Resorts vacation rental condos at Canal House have full kitchens, linens and dishes, stacked laundry and window mounted air conditioners, Canal House has easy access to the Waikiki Library just across the street and Kapiolani Park where you will find jogging and bike paths. It is three blocks(10 minute walk) from sandy Waikiki Beach. Rentals at Canal House are are offered only for a 30 day minimum or longer stay. Two bedroom vacation Rentals at Chateau Waikiki are deluxe accommodations with central air conditioning, full kitchens, washer/dryers in each suite, free WiFi, and assigned parking. There is a recreation deck with swimming pool, sauna, barbecue area, workout room and more. Chateau Waikiki is located on west end of Waikiki with short walking distances to Waikiki Beach, the Ala Moana Mall, Ala Moana Beach, Ala Wai Boat Harbor, and the Hawaii Convention Center. 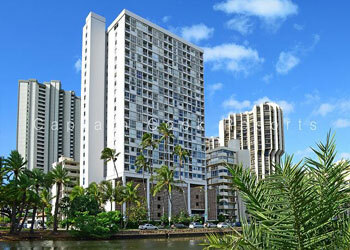 Rentals at Chateau Waikiki are are offered only for a 30 day minimum or longer stay. Pool: No, however this is a beachfront property. The Pacific ocean is your pool. Washer / Dryer: Located inside rental for some units. Please see the rental details or inquire. The Colony Surf is located oceanfront on the beautiful Gold Coast just outside of Waikiki. It has its own sandy beach directly behind the building, great for sun bathing and swimming. Located directly outside the front door of the Colony surf is Kapiolani Park which is a great area for walking, jogging, biking, or having a picnic. 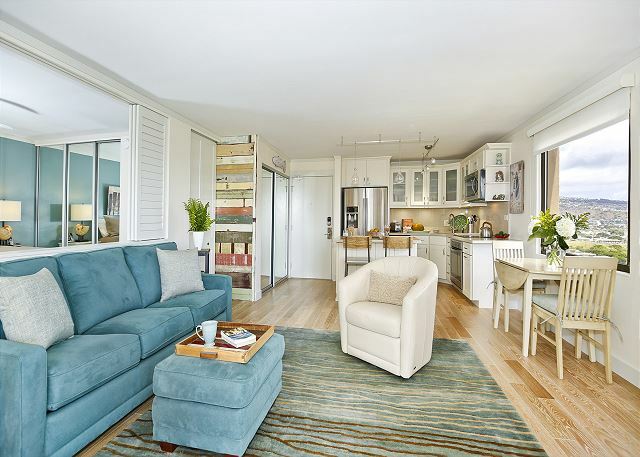 Vacation rentals at the Colony Surf are fully furnished, include full kitchens and are equipped with linens, dishes, beach towels and chairs. Some have on site parking included. The building is not air conditioned, but most of the time you will get the feeling of old Hawaii as you are cooled by Tradewind breezes. Discovery Bay is located at the west end of Waikiki near the Waikiki marina, Ala Moana Mall, Ala Moana Beach Park, and the Hawaii Convention Center. There are two towers with a variety of floor plans for each condo that offer wonderful ocean and/or mountain views. Each vacation rental is fully furnished with linens,dishes, include full kitchens, and washer/dryers in each unit. Building amenities include pool with large sun deck, jacuzzi, sauna and weight room. Security features locked lobby, private guards and video monitoring. This location is very convenient to the beaches and Friday night fireworks behind Hilton Hawaiian Village. And the beaches, jogging trail, and tennis courts of beautiful Ala Moana Beach. Fairway Villa is located in central Waikiki close to many restaurants and shops. Just across the street is the Ala Wai Canal where there is a walking and jogging path that runs the whole length of the canal, from here you can enjoy a walk while watching the outrigger canoes heading out to the ocean on their morning or evening paddle. You are one block from a food market and about 3 blocks to the beaches of Waikiki. We offer studios, one, and two bedroom suites. The studios feature compact kitchens while the 1 and 2 bedrooom suites have full kitchens. 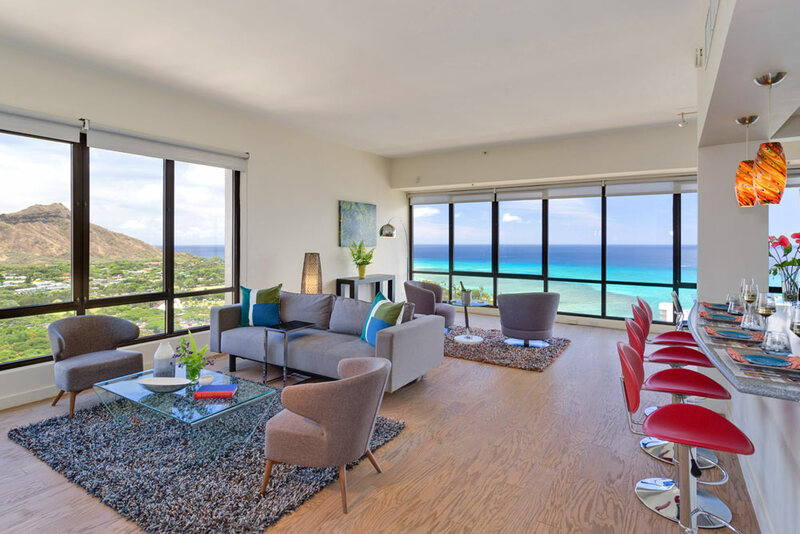 The suites offer views of the Koolau mountains and the Ala Wai golf Course and some have views of Diamond Head and a peek of the Pacific ocean. There is a washer/dryer in each rental. Vacationers will also enjoy views from the popular rooftop recreation area which is complete with a pool and hot tub. Minimum # of nights: 3 nights or 30 nights for some rentals, see details for each condo. A guest favorite, centrally located in Waikiki, with ocean views on one side and mountain views on the other. The Four Paddle offers a fine retreat for vacationers and corporate visitors alike. Four Paddle vacation rentals include central air conditioning, full kitchens, washer/dryers, and 1 assigned parking stall. There is a recreation deck with swimming pool, sauna and barbeque. 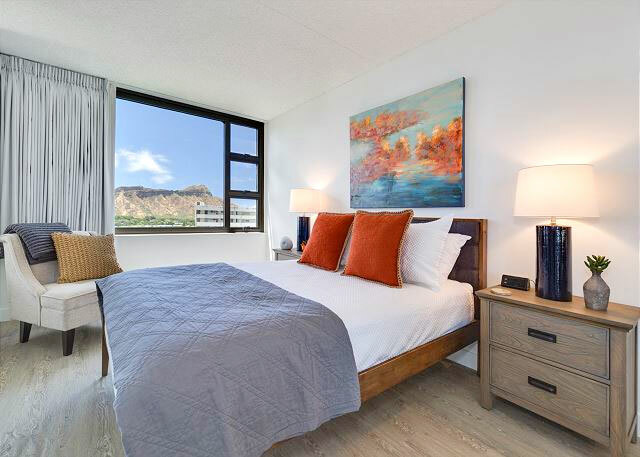 The vacation rentals at Four Paddle are also close to the newly restored Beach Walk area of Waikiki where you will find casual and fine dining restaurants, many specialty shops and evening entertainment. Four Paddle vacation rentals are within easy walking distance to Waikiki beaches and the newly renovated Royal Hawaiian Shopping Center. It is about a 10 minute ride to Ala Moana Shopping Center. We have some nightly rentals and some 30 night minimum only rentals at Four Paddle. Washer / Dryer: Located inside rental or public washer/dryer room on each floor. See unit details. 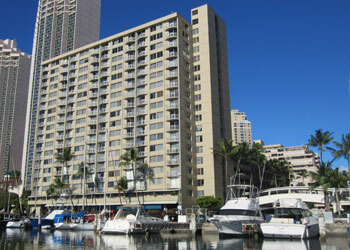 The Ilikai Apartments, also known as The Ilikai Hotel, is located at the west end of Waikiki on the Waikiki Yacht Harbor and close to Ala Moana Mall, Ala Moana Beach Park, and the Hawaii Convention Center. It is an easy 3-5 minute walk to the nearest swimming beach. And the beaches, jogging trail, and public tennis courts of beautiful Ala Moana Beach Park are about a 10 minute walk away. The 2 bedroom vacation rentals have sweeping yacht harbor and ocean views and on Friday nights you can see the fireworks display from your ocean facing balcony(lanai). 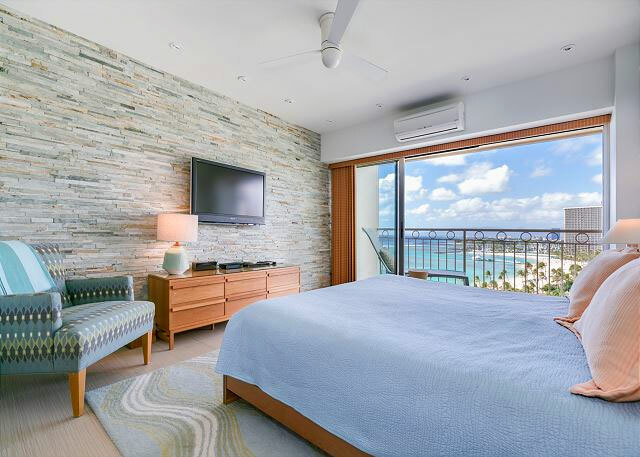 All of our condos at the Ilikai Apartments are air conditioned, include full kitchens, wireless internet (WiFi), and are furnished with linens, dishes and beach towels. There is an Italian restaurant, Sarento's, located on the top floor of the Ilikai, as well the more casual Ilikai Bar & Grill located on the lobby floor. Other popular restaurants nearby are The Chart House, Outback Steakhouse, and Red Lobster located just across the street, as well as several other local restaurants nearby. A few minutes walk or bus ride will put you in reach of all Waikiki's attractions and the beaches in central Waikiki. The bus for Waikiki stops along the street in front of the building. The Ilikai Marina is located at the west end of Waikiki on the Waikiki Yacht Harbor and close to Ala Moana Mall, Ala Moana Beach Park, and the Hawaii Convention Center. It is an easy 5 minute walk around the Waikiki Yacht Harbor to the nearest swimming beach. And the beaches, jogging trail, and tennis courts of beautiful Ala Moana Beach Park are about a 10 minute walk away. The 1 bedroom vacation rentals have sweeping yacht harbor and ocean views and on Friday nights you can see the next door fireworks display from your ocean facing balcony(lanai). All of our condos at the Ilikai Marina are air conditioned, include full kitchens, high speed wireless internet, and are furnished with linens, dishes and beach towels. Coin operated laundry facilities are located in the building and on site parking is available for a fee. There are a few popular restaurants such as the Chart House, Outback Steakhouse, and Red Lobster located on site as well as several local restaurants across the street and nearby. A/C: Yes (Window or split) see details for each unit. The Marine Surf is located in the heart of the action in Waikiki. If you are looking to be right in the in the middle of restaurants, bars and night life in Waikiki and just a couple of blocks to swimming beaches and surfing , then these budget priced accommodations at Marine Surf may be right for you. Shopping is all around you. There is a pool on site and each condo has a kitchen, high speed internet connection and free parking. 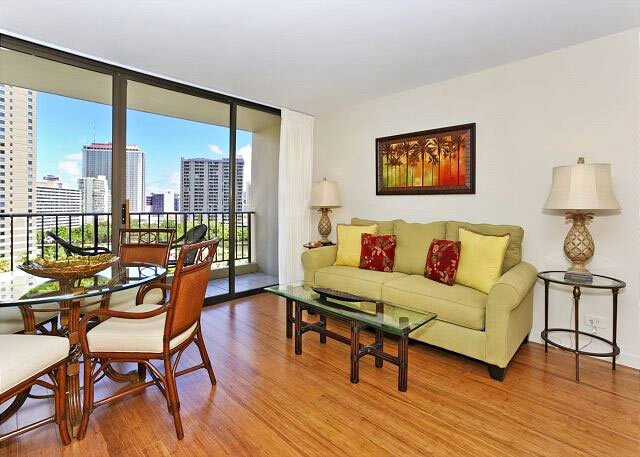 Marine Surf provides a great value for a small budget priced condo in the heart of Waikiki. Completely renovated in 2007, the Regency on Beachwalk is a high-end, contemporary boutique condo-hotel. All our vacation rentals in the Regency on Beachwalk are 2 bedroom / 1 bath units with large, spacious balconies that are great for indoor/outdoor living. 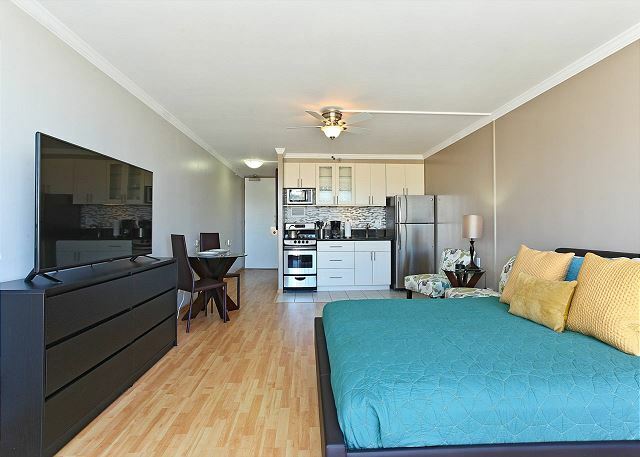 The Regency on Beachwalk is only a 3-5 minute walk to Waikiki Beach and Ft DeRussy Park. With its great central Waikiki location, you'll appreciate being just steps to the best beaches, fun outdoor activities, top restaurants, exciting night life, and the unparalleled shopping at Waikiki Beach Walk! Parking: Yes, 1 Parking Stall Included(Free). Not recommended for full-size vehicles. 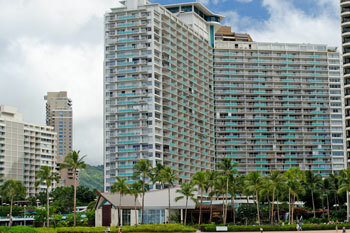 The Seabreeze is located oceanfront on the beautiful Gold Coast just outside of Waikiki near the base of Diamond Head. There are 2 small sandy beaches nearby the building, great for sun bathing and swimming. And, the much larger Kaimana beach is only a 5 minute walk. This Oceanfront building has only one unit per floor and with just one condo per floor, you’ll appreciate the privacy and relaxing serenity of this spacious, upscale condo. Located just a few minutes walk from the front door is Kapiolani Park which is a great area for walking, jogging, biking, tennis, or having a picnic. Rentals at the Seabreze are are offered only for a 30 day minimum or longer stay. The Waikiki Banyan located on the Diamond Head end of Waikiki is just a short walk to the Honolulu Zoo, Kapiolani Park and the world famous Waikki Beach. The Waikiki Banyan condos all have ocean, Diamond Head or mountain views, offer air conditioning, full kitchens and private lanais / balconies. There are coin operated washers and dryers on each floor. All our Waikiki Banyan properties offer complimentary WiFi and FREE parking. This property is great for families and known for being among the most kid-friendly properties in Waikiki. There is a large recreation deck with barbeque grills, children's playground, heated pool, Jacuzzi, sauna and lighted tennis courts. Located in the lobby of the Waikiki Banyan is the Banyan Breeze Coffee Co. which features iced tea, lemonade, fruit smoothies, breakfast bites and an assortment of sandwiches and salads. 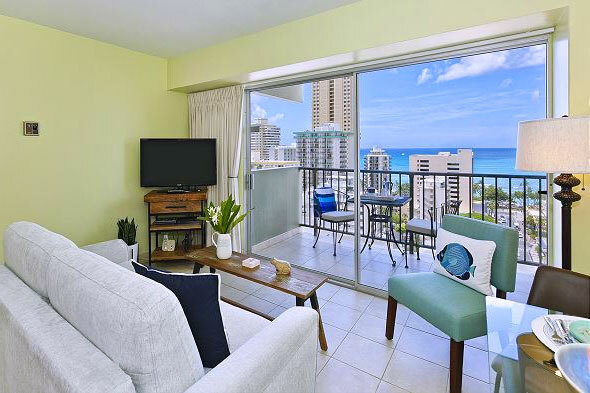 Located directly across the street from Waikiki beach are our Waikiki Beach Tower Vacation Rentals that offer large (over 1000+ Sq Ft) 2 bedroom 2 bath condominiums with full kitchens, washer and dryer in rental, linens and dishes, and WiFi. 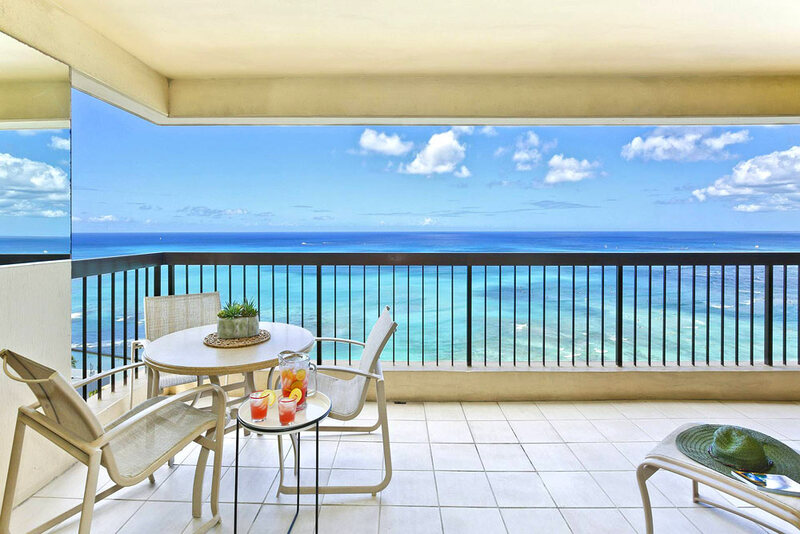 Each rental at Waikiki Beach Tower has an extra large lanai affording opportunities for outside dining while enjoying sweeping views of the Pacific ocean, Waikiki shoreline and fabulous sunsets. There is a swimming pool and jacuzzi on site and 1 assigned covered parking is included. Located in the heart of Waikiki where you are able to walk to many casual and fine dining restauranrts, shopping and entertainment. Water sports and equipment rental can be found across the street at Waikiki Beach. 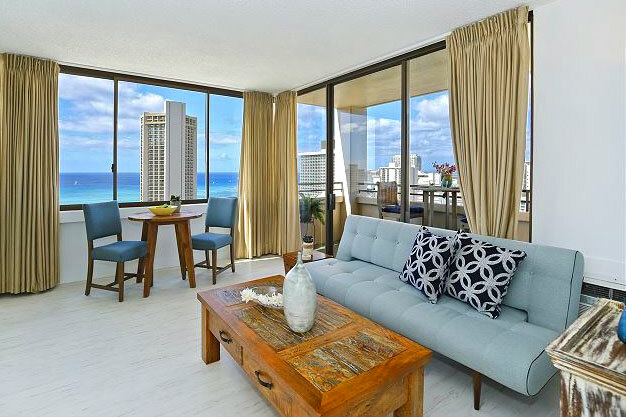 Waikiki Beach Tower Vacation Rentals are where to stay in Waikiki for the best access to swimming, surfing, a variety of water sports, and proximity to everything Waikiki has to offer. 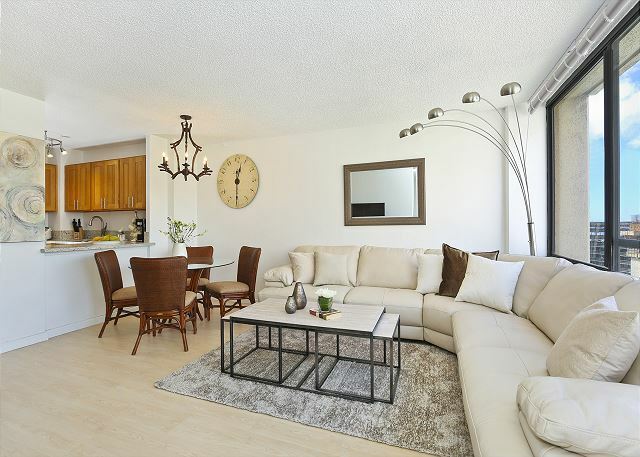 This is truly one of the finest condominiums in Waikiki. Washer / Dryer (In Rental): Coin-operated facilities on site (not in unit). Great for singles, couples or small families at prices anyone can afford, Waikiki Park Heights is a 5 minute walk to one of the best swimming beach areas in Waikiki. Most of these 1 bedroom condos have ocean views and have kitchenettes or full kitchens. Some have a Japanese style Furo (soaking tub) with separate shower stall or an extra large shower area. This is a clean well managed building with 24 hour security. It has a large sundeck with pool and laundry facilities, on site parking is available for a fee. Close to Waikiki beach, restaurants, and shopping. Waikiki Beach: Located on Waikiki beach. Just an elevator ride away. Waikiki Shore is the only private condo directly on Waikiki beach, where you can step right from the building onto the sand. We offer studios and 1 or 2 bedroom condos, all with fabulous unobstructed ocean views and tropical sunsets from your large full length lanai / balcony. 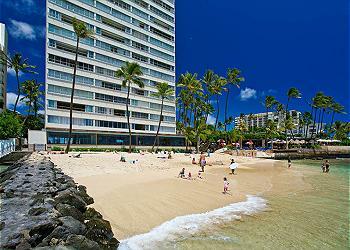 Waikiki Shore vacation rentals are truly a fine choice for a beachfront vacation rental at a great price. These condos have A/C, full kitchens, and in unit washer/dryer. Some on site parking is available. The Waikiki Shore condos are just steps to the newly restored Beachwalk area of Waikiki and within easy walking distance to casual dining, some of the finest dining Waikiki has to offer, speciality shops and night life. About a block away is the newly renovated Royal Hawaiian Shopping Center in Central Waikiki with its world class shopping with many new restaurants and specialty shops as well as daily Hawaiian cultural activities. The condos at Waikiki Shore are located in front of a great beach for swimming and other water activities. These condos are spacious and bright with large floor to ceiling sliding doors and large windows that capture the surrounding beauty and bring in cool island trade winds. Kitchens include a full size refrigerator, range/oven, microwave, dishwasher and washer/dryers. Most rentals have wood floors in the main living area and carpets in bedrooms; kitchens and bathrooms have tile floors. There is at least one A/C unit in each condo as well as ceiling fans in the bedroom or living room. Included in your rates are WiFi, free local and US mainland phone calls as well as 1 assigned covered parking. Captain Cook Resorts condos at Waikiki Sunset are just a short walk to the Honolulu Zoo, Kapiolani Park, and world famous Waikki Beach where you will find some of the most relaxed swimming on the island. 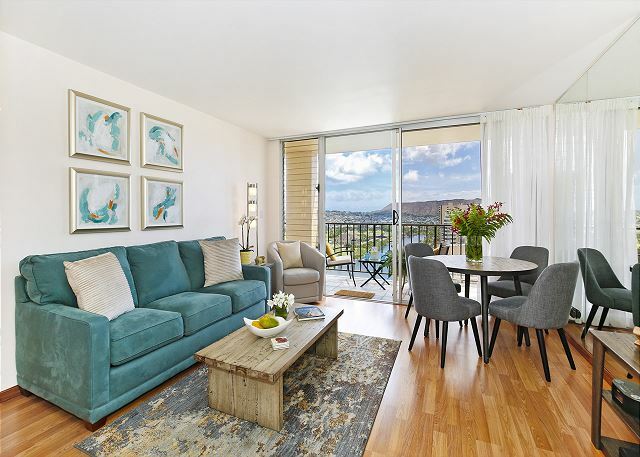 The Waikiki Sunset condos have ocean, Diamond Head or mountain views, offer central air conditioning, full kitchens and private lanais/balconies. There are coin operated washers and dryers on each floor. All Captain Cook Resorts Waikiki Sunset properties offer complimentary WiFi and FREE parking. These rentals are great for families, couples or singles. The property offers a large recreation deck with barbeque grills, swimming pool, sauna and lighted tennis courts. There is an activity desk in the lobby, coin operated laundry facilities on each floor, free parking and free high speed/wifi Internet access in your condo. From the Aloha Towers to the Waikiki Sunset, we have more than a dozen gorgeous rental properties located throughout Waikiki. From oceanfront condos to sprawling apartments, we offer them all. Click on any property name to learn more about the location, the amenities, and all of the necessary details. We have rentals to suit individuals, couples and groups, and we can work with you no matter what your budget. If you're still not convinced that these rentals are right for you, just take a look at the gorgeous accompanying photographs. 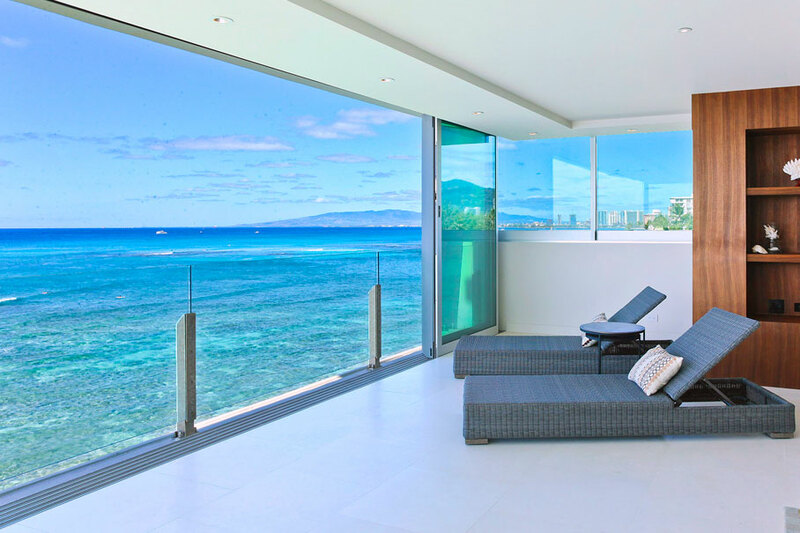 These are real images that capture the beauty and tranquility of our Waikiki condos and the surrounding area. Waikiki is the jewel of Honolulu, and our vacation rentals in Waikiki are perfect for exploring the island at your own pace. You'll feel like you have found your very own home on the island, and you'll lament over ever having to leave. The tricky part is choosing the perfect rental property for you.